Small businesses are challenged by two things: Getting new customers, and making the most of the relationships they have with existing customers. With social media and word of mouth marketing on the rise, it's become clear that the greatest source of new customers is your current customers. The more you treat your loyal, current customers like VIPs, the more they will come back. And, those customers will interact with you and about talk about you on their social networks, opening up the door to new customers. Your current customers are your most important marketing asset. According to Nielsen, 43% of all mobile users own a smartphone. Among those under 45, the number is more than 50%. A related Pew Internet study found that 87% of smartphone users access the internet or email on their device, including two-thirds who do it daily to look for deals and information. The point is, consumers these days are "always on," and are connecting with businesses and each other wherever they are. Making the most of mobile technologies to engage those customers and encourage their loyalty and advocacy is the natural next step. With this in mind, I'm so happy to announce that Constant Contact has acquired CardStar, which helps shoppers stay connected with their favorite merchants through a mobile app. This free mobile loyalty app consolidates membership and rewards cards on smartphones, letting consumers use a single application rather than a series of physical cards. The app currently has more than 2 million active users and is available on major mobile platforms such as iPhone, Android, and Blackberry. CardStar works with larger retailers, small businesses, and even local resources like libraries. I'm most excited about the potential it has for small businesses. CardStar and Constant Contact will do for loyalty systems what we have done for email marketing, social media marketing, and event marketing — make it easy, effective, and affordable. 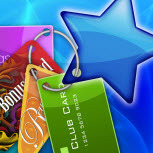 And we will enable your customers to use the same mobile app where they store their national loyalty cards. Over time, our solution will allow you to tailor mobile deals and information to your customers, and to track engagement so you can reward those customers' loyalty. Today’s consumers don’t just want, they expect access to information and the ability to make decisions on the go, and they want to be rewarded for their support and loyalty. The CardStar mobile app makes this possible, letting consumers engage with businesses like you when they're on the go, and providing you with expanded opportunities for the kind of customer engagement that drives real business results. In our most recent Attitudes and Outlook Survey, 72% of small businesses told us they don't already incorporate mobile into their marketing campaigns. CardStar provides a great opportunity to start doing just that. I encourage you to download the CardStar app today and check it out for yourself. Then enable your customers to take advantage of it, so you can see how it will help your business. YEA!!!! Yea and hooray! As a one person company that has taken a crack at Facebook apps....canvas and mobile, I would say that getting anthing onto mobile phones is a level of complexity that very, very few small companies are positioned to handle. I would LOVE to find a way to get onto mobile phones. It's a great, great direction for CC to take.